Happy Invites, Mumbai helps you spread joy and it all begins with an invitation. Exclusive invitation videos with a customised personal touch just for you. It is the best choice for, online digital video invitation designs for all the special occasions of your life. Whatever the reason to celebrate, be it save the date for engagement, wedding, marriage anniversary celebrations, birthday parties, baby showers they offer the perfect animated invites to get your party started in style! They believe, ‘Communication is an extension of personal style’. Their team is innovating on tradition and redefining the way you connect with people be it via Whatsapp, Facebook, Youtube or a simple Mail. It’s all about when ‘Beautiful design meets creative technology’. Contact Happy Invites, Mumbai and discuss your invitation needs. Over 70 ready to go templates that we can offer within 2 working days and even customise how you wish to have it. Happy Invites is a invitation card based out of Mumbai . 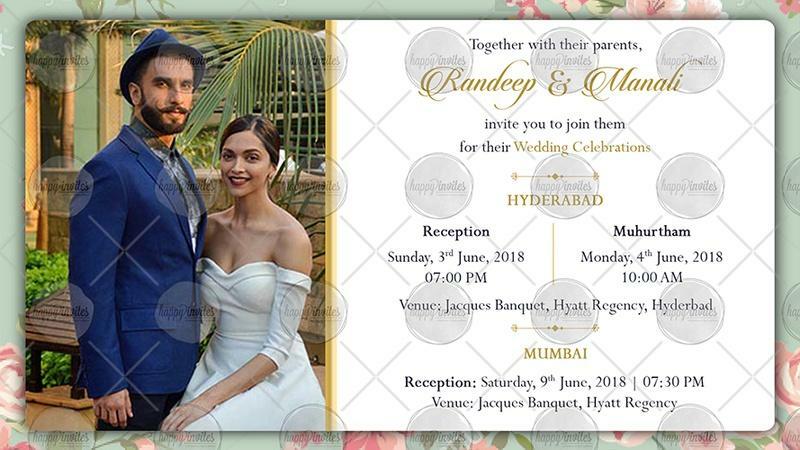 Happy Invites's telephone number is 76-66-77-88-99, Happy Invites website address is https://happyinvites.co, Facebook page is Happy Invites and address is Bandra Kurla Complex. In terms of pricing Happy Invites offers various packages starting at Rs 1500/-. There are 0 albums here at Weddingz -- suggest you have a look. Call weddingz.in to book Happy Invites at guaranteed prices and with peace of mind.